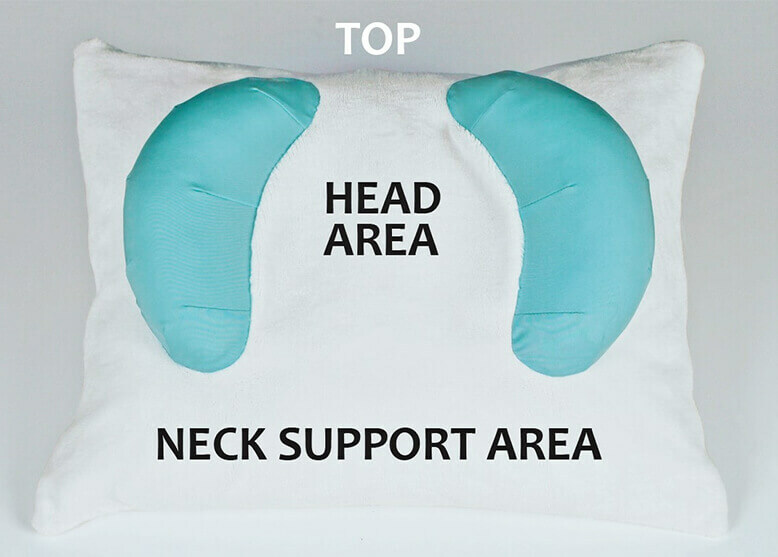 Back to Beauty Anti-Wrinkle Head Cradle Beauty Sleep Pillow: Wrinkle Prevention and Anti Acne True Beauty Sleep Solution, Saving Faces Around the World. Are You Giving Yourself Wrinkles While You Sleep? Prepare to be horrified. Studies show sleeping on your side and stomach creates sleep lines and wrinkles (not to mention jowls, bags under the eyes, neck, chest, and breast wrinkles) that become etched into the skin and won’t go away over time. With the average human head weighing between 8-11 pounds, those not sleeping on their back are putting weight and pressure on delicate facial skin and reducing or even counteracting the benefits of moisturizing anti-wrinkle lotions, acne treatments, cosmetic injections, and facial surgeries. Do you hate sleeping on your back? You aren’t alone. Many have trouble consistently and comfortably sleeping on their back. And if you aren’t already a back sleeper, deciding to sleep on your back isn’t as easy as it sounds. Back sleeping requires time to train yourself, and even then, it’s hard to feel secure and snuggled when your head is susceptible to the gravitational pull that will make it fall to the left or right during sleep. 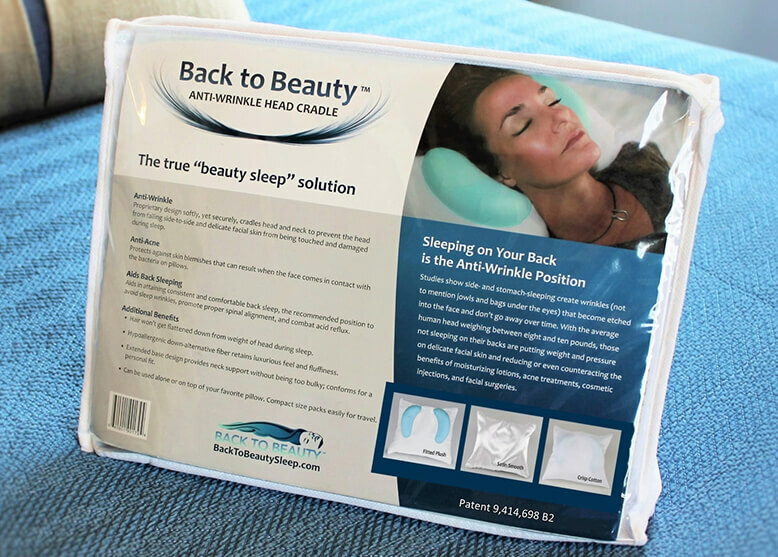 Back to Beauty’s patented design doesn’t just focus on anti-aging wrinkle prevention, but also addresses the difficulties and discomforts of back sleeping. 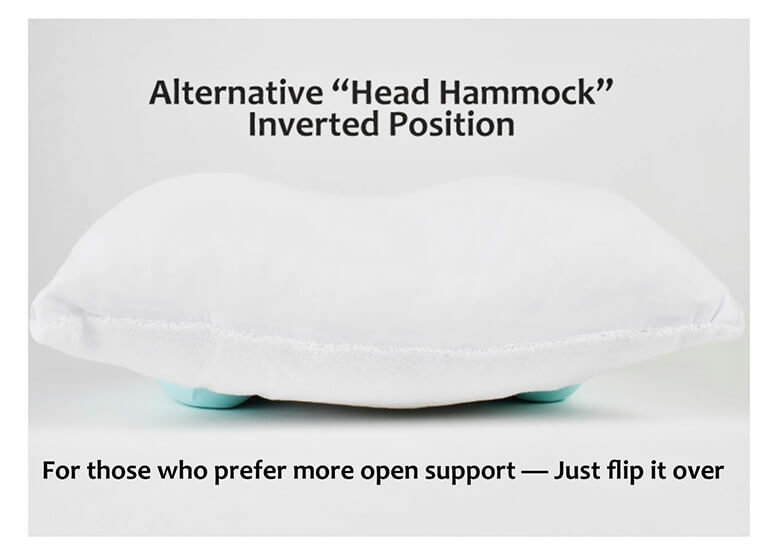 The unique crescents at the top of the base, cradle the head, allowing you to feel secure without putting any weight on your face. The extended length of the cradle base, beneath the crescents, also offers important and comforting neck support. 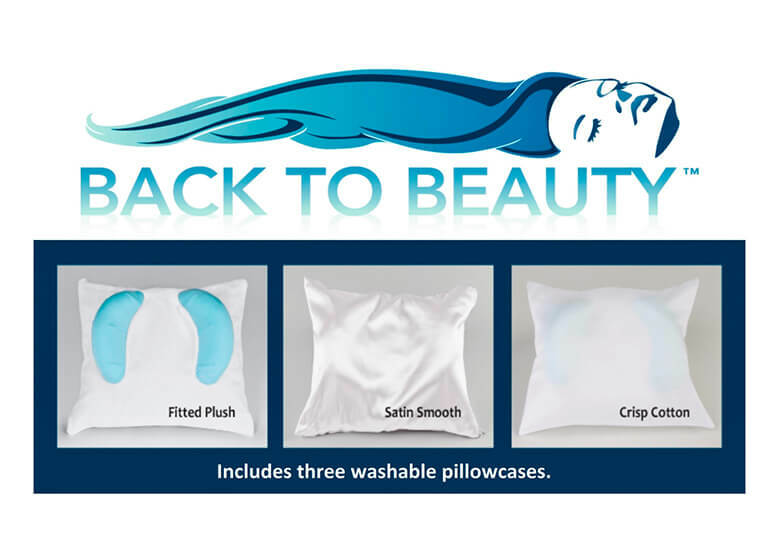 The Back to Beauty Anti-Wrinkle Head Cradle beauty pillow’s proprietary design softly, yet securely, cradles the head and neck to prevent your head from falling side-to-side, and keeps delicate facial skin from being touched and damaged during sleep. It also prevents you from giving yourself neck, chest, and breast wrinkles while you are sleeping. Protects against skin blemishes that can result when the face comes in contact with the bacteria on pillows. to avoid sleep-line wrinkles, promote proper spinal alignment, and combat acid reflux. + Face lotions will be left undisturbed, allowing them to do their job. + Hair won’t get flattened from weight of head during sleep. + Hypoallergenic down alternative fiber retains luxurious feel and fluffiness. + Extended base design provides neck support without being too bulky; conforms for a personal fit. + Can be used alone or on top of your favorite pillow(s). Training yourself to become a back sleeper isn’t easy, takes time, and ultimately is not for everyone. (Please be sure to view my “Instructional Video” to see if back sleeping with Back To Beauty is right for you.) 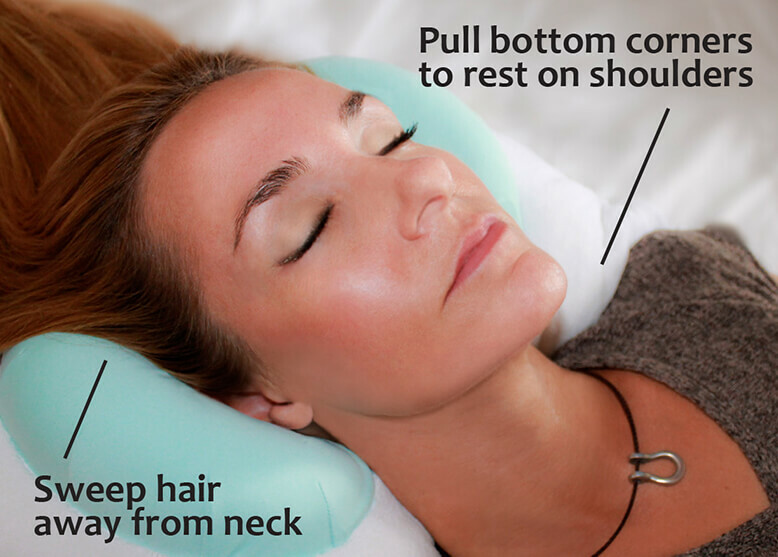 Although back-sleeping is considered one of the healthiest sleep positions to promote proper spinal alignment and combat acid reflux; and many users of the Back to Beauty Anti-Wrinkle Head Cradle beauty pillow have described personal beneficial experiences that assisted with their neck, jaw, sleep apnea, GERD and back issues; the pillow was not designed, nor promises, to be a remedy for those specific conditions. Pregnant woman, those with sleep apnea, spine/back or cervical/neck problems or any other medical condition, should consult a doctor before deciding to start back-sleeping. The Back to Beauty Anti-Wrinkle Head Cradle beauty pillow is not intended for children, and should never be used to secure a baby for sleeping.